During the long weekend Nelson Search and Rescue hosted the fourth annual RAFTEX training weekend. Jun. 1, 2016 6:00 a.m.
During the long weekend Nelson Search and Rescue hosted the fourth annual RAFTEX training weekend. You may have seen a colourful flotilla of 14 rafts paddling down the Slocan River. This event brings regional swiftwater teams from around the province together to train in rafting operations during rescue events. This type of water craft operation is very specialized and requires a lot of time and experiential training to become skilled at, spokesman Chris Armstrong said. Teams from Nelson, Fruitvale, Penticton, Panorama, Sparwood, Invermere, Oliver and Kelowna all took part in the advanced training. This year four new members also passed their BC Raft Outfitter Association guides certification. 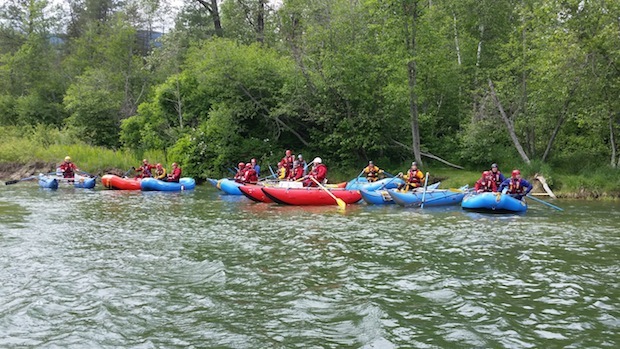 “Nelson Search and Rescue was proud to once again host the BC Search and Rescue Association sponsored event on our wonderful local rivers,” Armstrong said.